Repsol Honda’s Marc Marquez equalled Mick Doohan’s premier-class record of twelve wins in one season after the newly-crowned MotoGP champion won a gruelling battle in sweltering conditions at Sepang International Circuit. After smashing the outright lap record yesterday during qualifying, Marquez set a new Sepang Circuit Record Lap time of 2’01.150 on lap two as he battled with the Movistar Yamaha MotoGP duo of Valentino Rossi and Jorge Lorenzo at the front of the field. Lorenzo led for the opening nine laps of the race before being passed in quick succession by first Rossi and then Marquez, but the 2014 World Champion seized the race lead just a couple of laps later. 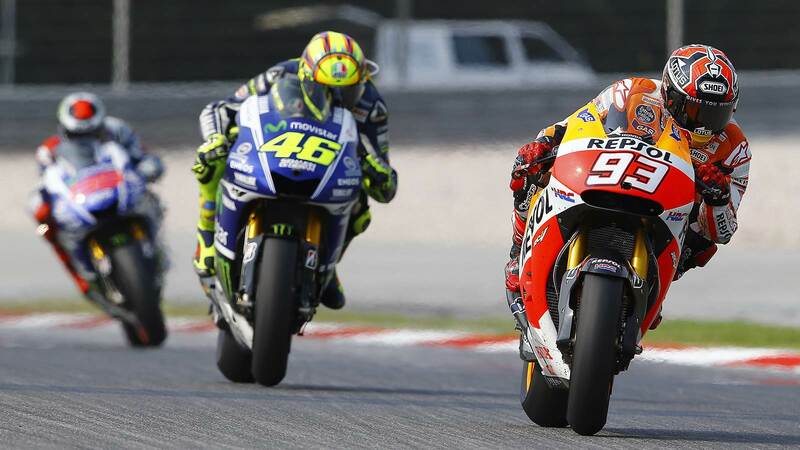 Marquez ultimately won the race 2.445 seconds ahead of Rossi, while Lorenzo crossed the finish line in third place a further second behind. Conditions at Sepang were once again extremely hot today, with a peak track temperature of 55°C during the race making today’s contest the warmest Malaysian Grand Prix in the past few years. Front tyre choice for the race saw fourteen of the twenty-two starters select the medium compound front slick, with the remaining eight riders opting for the hard compound front slick. For the rear tyre, thirteen riders – including all Factory Ducati, Honda and Yamaha riders selected the medium compound rear slick and nine riders selected the soft compound rear which was only available to the Ducati and Open-class riders at Sepang. With just one round remaining, Marquez’s twelfth win of the season sees his points total swell to 337 points, while Rossi’s second place at Sepang sees his lead in the championship standings over teammate Lorenzo grow to twelve points.